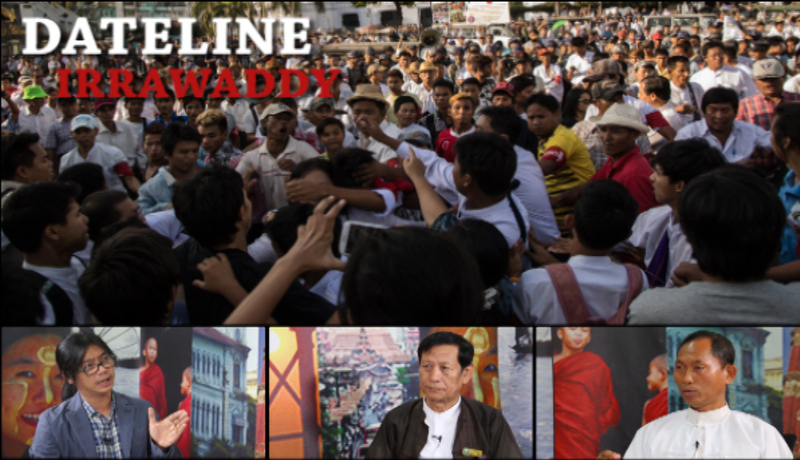 In this week’s edition of Dateline Irrawaddy, Kyi Myint of the Myanmar Lawyers Network and 88 Generation leader Ko Ko Gyi join The Irrawaddy editor Aung Zaw to discuss the Mar. 5 crackdown on a student protest in downtown Rangoon. Aung Zaw: This week, we’ll discuss the violence in front of Rangoon City Hall and ongoing student protests. I am Aung Zaw. One of the leaders of 88 Generation Students Group, U Ko Ko Gyi, and U Kyi Myint from Myanmar Lawyers Network will join me for the discussion. U Kyi Myint and U Ko Ko Gyi, last week there was a brutal crackdown on peaceful protesters in front of Rangoon City Hall. Plainclothes people wearing red armbands with the word ‘duty’ beat students and disgracefully grabbed and dragged protesters into cars. Journalists captured the crackdown, which was then strongly denounced by the international community. What is the government’s response? How did it handle the situation? What level of government officials were involved? In the aftermath of the crackdown, U Ko Ko Gyi and the leaders of 88 Generation Peace and Open Society held talks with Rangoon Division Chief Minister U Myint Swe. So, U Ko Ko Gyi what did you discuss with him? What was their response? Ko Ko Gyi: Among the usual challenges during transition period, the ongoing student protests are at present the most prominent. We talked about the moves to amend the National Education Law and the crackdown on the protest by plainclothes civilians wearing red armbands in front of City Hall. Plainclothes people, who are obviously thugs by their appearance, beat and arrested protesters. What is worse is that one of them robbed a female student of her dignity. He had tattoos and was wearing a vest. It was quite shocking. AZ: Did they agree with your points? Did you have to argue with them? KKG: I won’t talk about the details, but here is summary of the discussion. Government officials, especially the responsible persons at the President’s Office, after the event justified the crackdown on their Facebook pages—saying that it was carried out in line with Articles 127 and 128 of the Code of Criminal Procedure. To me, that is totally unacceptable. In the past, the military regime used thugs through the ‘Swan Ah Shin’ group. According to some reports, the government even paid the thugs money to join the group. The inglorious Depayin Massacre was committed by them. This time, they were brought in cars to Rangoon, carrying bamboo sticks and weapons, in order to commit violence on democratic forces, which tarnishes the image of the country on international stage. This is the reason behind the country’s prolonged economic sanctions. While the government is talking loudly about its democratic transition, the fact that such violence has resurfaced again suggests that they are reversing course against expectations. We have openly talked about this and criticized this. AZ: We have yet to discuss whether the country is regressing, is still in the abyss or will be able to move forward. U Kyi Myint, I have a question about Articles 127 and 128. Shortly after the crackdown, the President Office said that the crackdown was in line with law. As far as I know, Rangoon Division Chief Minister U Myint Swe also said that he took actions within the boundaries of the law and did no wrong. Did they have such a legal authority? Would you explain this to us? Kyi Myint: It was not in accordance with law. The word ‘people’ in Article 128 means ‘good persons’ among the people at the scene. In the case of the City Hall crackdown, they were brought to the scene. So, they are not legitimate. If they were legitimate according to Article 128, then Article 132 says they will not be charged. The Article 128 means settling the issue by asking for the involvement of good persons among the people at the scene. AZ: What do you mean by settle? Do you mean settling when the crowd gathers or settling a riot? KM: The first stage is warning the protesters, according to Article 127. Any magistrate or officer in charge of a police station or police officer not below the rank of sub-inspector may give the warning. It is the stage before Article 128, which addresses crowd dispersal. In dispersing the crowd, the article only allows the use of civilians and does not allow the use of military forces and forces constituted by the Burma Territorial Force Act or the Burma Auxiliary Force Act. The law does not say thugs and gangsters can be used. AZ: As far as I understand, [the Code of Criminal Procedure] is a law passed in 1898 during colonial period. The law says that police must seek help from good and honest citizens of the country, doesn’t it? KM: Yes. It is not in line with Article 128 since they are thugs and not honest people. The fact that it is against Article 128 means it is not in compliance with the law. So, we have clearly said in our statement that victims of the crackdown can prosecute under relevant charges. AZ: U Ko Ko Gyi, will you take legal action if prosecution is possible? KKG: As far as I understand, Article 354 of the Constitution provides freedom of expression for every citizen. The Constitution is above all other laws in our country. Last year, a law was enacted regarding the right to peaceful assembly and procession. Even if the protest dispersal followed the law, freedom of expression is the birthright of our citizens. Peaceful assembly and procession is a fundamental right of citizens. Even if we are to refer to the existing laws, the law on peaceful assembly and procession is the latest law of its kind and the law under which the crackdown was carried out was enacted more than 100 years ago, in 1898. The two laws are conflicting. But then, it is obvious that the protesters were not carrying arms. Again, it was not a riot, but a peaceful assembly. If they are to be charged according to existing laws, they can only be charged for not seeking permission for assembly under Article 18. According to Article 127, the crowd was to be ordered to disperse and Article 128 was to be exercised only when the crowd did not disperse. In front of City Hall, the crowd was ordered to disperse within 30 minutes. But after 20 minutes passed, plainclothes thugs beat the protesters. So, Article 128 was exercised unnecessarily while the situation was not that bad. Again, the crowd was not committing a riot, nor had they been staging sit-in long there nor were destroying public or private properties. So, the crackdown was carried out in line Article 128. Article 128 says it may require the assistance of any male person to disperse the crowd, which can be interpreted as meaning it may require the assistance of civilians in case there is no enough police force. But then, taking a look at photos and video files, the number of police was not smaller than that of protesters. So, even though they were able to handle it, they asked for the assistance of civilians. The provision is not always necessary; it only means civilians can be asked to assist when there are not enough police. From the photos of the event, it is obvious that those people were arranged in advance and brought to the scene intentionally, and it was not asking civilians for help because there were not enough police. It is obvious that these people with red armbands were deployed prior to the protest. Again, we can see clearly from photos that they were holding batons and sticks even though authorities said they were unarmed. They did not have the right to exercise Article 128, and they also broke the law. AZ: Both U Ko Ko Gyi and Uncle U Kyi Myint have described them as thugs. I have heard that township administrators brought the thugs from their respective townships. Taking a look at the photos, it is very clear that it is more appropriate to call them as thugs. My question is, who is the mastermind behind this crackdown? What level of government can issue such a command? If we assume that that order is given by the government, the question is if it given by the President’s Office, the National Defense and Security Council, the Home Affairs Ministry, or the Chief Minister of Rangoon Division. Who will take responsibility for this? KM: The Information Minister denied that the Union government was responsible. He said the Union government does not have Swan Ah Shin and only divisional and state governments would have them. AZ: So, are they passing the buck? What do you think, U Ko Ko Gyi? KKG: We should compare the cases. Students have been staging a sit-in protest in Pegu for weeks now. * But, there was no violence in Pegu while there was in Yangon and I think it is concerned more with the division or state as to whether violence will occur. Another view is that in the case of matters related to national security, the National Defense and Security Council may make a decision, and the way the decision is implemented may differ from one divisional or state government to the other, I think. AZ: Uncle U Kyi Myint, U Ko Ko Gyi, Thank you very much. We are ending our discussion here and we’ll continue with this topic next week. * This episode was recorded on the morning of Tuesday, Mar. 11. Shortly after production finished, police began a crackdown in Letpadan, Pegu Division, which resulted in the violent dispersal of a student assembly at the local monastery.